Each of us has a unique journey. As the horizon lies before us, it is often helpful to have someone share the journey. Client and therapist share a caring, working alliance. These two, one an expert on his or her own life, the other knowledgeable about the journey of life, explore life's possibilities with comfort, ease, combined strength and renewed action. Shared work brings celebration, abundance and effective living. Good counsel can be a daring adventure or a peaceful sojourn, but it is always an enriching passage. NEW: Skype and FaceTime sessions now available. MICHELE IS NOW SPECIALIZING IN LIFE COACHING! 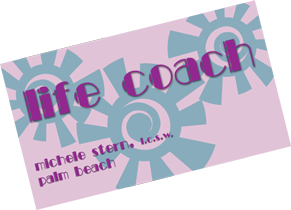 From Palm Beach Island to around the globe, ask about Michele as Life Coach... any where in the English speaking world.